Dr. Safwat Abdel-Azeim received his Ph.D. and M.Sc. degrees from Paris XI University in Molecular Physical Chemistry, 2008 and 2004, respectively. 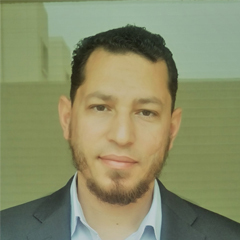 Before joining KFUPM, in February 2017, he was a research associate at KAUST, Solar and Photovoltaic Engineering Research Center (SPERC). His main expertise is the Molecular dynamics simulations, Density Functional Theory (DFT), and, the hybrid method between quantum mechanics and molecular mechanics (QM/MM). He has a broad research experience including the bio-molecules modeling, surface chemistry, NMR simulation, reaction kinetics, and, polymer modeling. At CIPR, he is interested in EOR (chemical) related research mainly the colloid stability and wettability alteration. PhD, Physical Chemistry, University of Paris-Sud XI, France, 2008. MSc. Physical Chemistry, University of Paris-Sud XI France, 2004. DES Non-organic Chemistry, Cairo University, Egypt, 2000. BS, Chemistry, Cairo University, Egypt, 1997. Modelling of organic photovoltaic and COF polymers using Molecular Dynamics Simulations and DFT. Modelling of chemical reactions in the complex systems (Bio-catalysis). Modelling of molecular interactions (protein-ligand, RNA/DNA-ligand and Protein-DNA interactions). Mohamed M. EL-Deeb, Hamed M. Alshammari and Safwat Abdel-Azeim, Effect of Ortho-Substituted Aniline on the Corrosion Protection of Aluminum in 2M H2SO4 Solution, Canadian Journal of Chemistry, Feb, 13 (2017). S. Matthew Menke, Aditya Sadhanala, Mark Nikolka, Niva A. Ran, Mahesh Kumar Ravva, Safwat Abdel-Azeim, Hannah, L. Stern, Ming Wang, Henning Sirringhaus, Thuc-Quyen Nguyen, Jean-Luc Brédas, Guillermo C. Bazan, and Richard H. Friend. Limits for Recombination in a Low Energy Loss Organic Heterojunction, ACS Nano, (2016), 10 (12), 10736–10744. Safwat Abdel-Azeim, Abdesslem Jedidi, Jorg Eppinger and Luigi Cavallo, Mechanistic Insights on the Reductive Dehydroxylation Pathway for the Biosynthesis of Isoprenoids Promoted by the IspH Enzyme, Chemical Science, (2015),6, 5643-5651. Safwat Abdel-Azeim, Romina Oliva, Edrisse Chermak, Raimondo De Cristofaro and, Luigi Cavallo, Molecular Dynamics characterization of five pathogenic factor X mutants associated with decreased catalytic activity. Biochemistry, (2014), 53 (44), 6992. Safwat Abdel-Azeim, X. Li, L. W. Chung and K. Morokuma, Zinc-Homocysteine Binding in Cobalamin-Dependent Methionine Synthase and its Role in the Substrate Activation: DFT, ONIOM and QM/MM Molecular Dynamics Studies, Journal of Computational Chemistry, (2011), 30;32(15):3154. Safwat Abdel-Azeim, “Protein ligand binding interactions – ONIOM and molecular mechanics studies” VDM Verlag Dr. Müller (21 July 2010). CREST Post Doc fellowship, Kyoto University, Japan, 2008/09. SIDACTION Post Doc fellowship, ENS-Cachan, France, 2009/11. KAUST Post Doc fellowship, 2012/14. CECAM-HQ-EPFL fellow to attend tutorial on Hybrid Quantum Mechanics/Molecular Mechanics (QM/MM) Approaches to Biochemistry and Beyond, 2013.